There’s a new trailer for Deadpool 2 in the pipeline, and it’ll be with us sooner than expected. Trailer Track brings word that 20th Century Fox’s sequel is preparing to showcase some new footage tomorrow, March 22nd, and the outlet has even narrowed the launch window down to 9 am ET (6 am PT/1 pm UK), based on Fox’s recent track record. 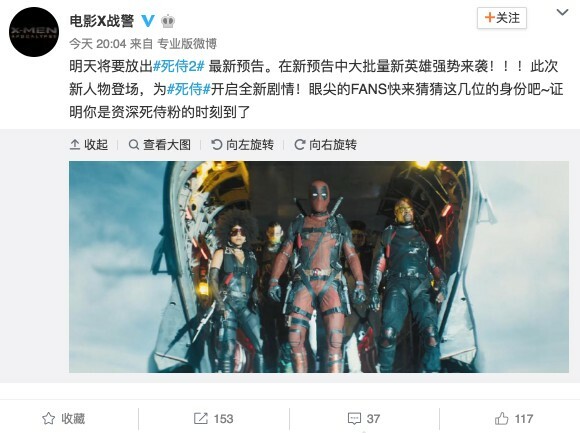 News of this alleged trailer dump was initially uncovered by the X-Men Weibo account (via Twitter), with all signs pointing to a more traditional, by-the-numbers teaser. So far, the Powers That Be have embraced the Merc’s irreverent humor with a Bob Ross-inspired preview and a second trailer that spent as much time poking fun at Avengers: Infinity War and Justice League as it did showcasing Ryan Reynolds’ titular, gun-toting protagonist in action. So perhaps it’s time to give the fans an extended peek at one of 2018’s biggest sequels? If Trailer Track’s findings hold true, we’re less than 24 hours out from Fox’s latest (and likely final) preview for Deadpool 2, so stay tuned. Tomorrow will be released #Deadmen 2 # latest notice. In the new notice, a large number of new heroes have struck! ! ! This new character comes on stage to open a new story for ## The tip of the FANS Come and guess the identity of these few people. It’s time to prove that you’re a senior deathguard powder. Flanked by Domino and Cable – Zazie Beetz and Infinity War‘s Josh Brolin, respectively – the Merc With a Mouth will officially return to our screens on May 18th, and there’s every chance that Deadpool 2 will lay the groundwork for Fox’s mooted X-Force movie, which recently tapped Drew Goddard to write and direct.